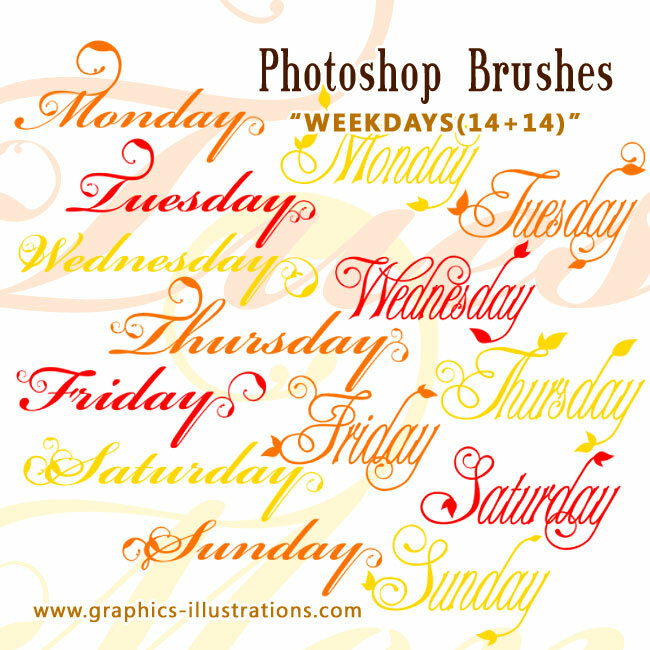 Here comes another free set of Photoshop brushes on Graphics-Illustrations.Com. This time the theme is Weekdays! So, how can a photoshop brush like that be useful and helpful for your small and big projects? Many ways. Say, you prepare a barbecue on Friday. And you want to make a nice invitation. And you want to make sure that the word “Friday” is written, like, nicely. What do you do? Of course, you press F5 and voila! There goes the solution for this little project. You can afford to use standard fonts for the rest of the invitation, but the word “Friday” will stand out. So, as we know, there are seven days in the week, but I made each of the day in seven different styles and two different sizes. Like I always say, it is not recommended to stretch Photoshop brush too much out of the original proportion so if you need small wording, select the smaller brush. And vice versa. So, you won’t have to stretch it too much. OK. Without further ado, here they are, they are not just Photoshop 7 brushes, they are also Photoshop CS, CS2, CS3, CS4 and CS5 and they will be, most probably, compatible with newer versions of Photoshop as they come. These are also GIMP compatible. Latest versions of GIMP support .abr files so there is no need to convert them into GIMP format or png. Let me know what you think of them. Say a word or two on your Facebook page. Awesome, I can totally use these! Thanks so much! I follow you on Facebook and want to thank you for sharing your brushes. I just don’t understand. The brushes are beautiful, as usual. I’ve been a member for nearly a year and I can’t figure out how to log in to get the brush download. Many links go right to the link. As it is, this is an older link, I guess, past 5 days. But, I’m a member and don’t know how to get them now. Su, when you enrolled to GBG you received a link for free downloads. No need to log in, just click on that link and it will take you to downloads page. I’m a bit confused. I am a member, but I get messages telling me to join so I can access the free downloads. What am I doing wrong? If you are a member then you have the link for downloads. It was sent to you during the registration process. If you lost it or can’t find it just drop me an email to info(at)graphics-illustrations.com and I will send you the link again.